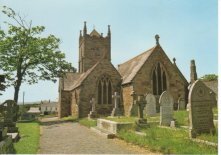 If you cannot find what you were looking for in the Phillack (or St. Elwyn) transcriptions, check the St. Erth parish register transcriptions as many St. Erth parish register entries refer to residents of Phillack or Hayle. Click to go to the St. Erth parish register transcriptions. Some information on baptisms after 1907 is available by contacting me. Transcriptions from 1837 to 1927 now include full details from the parish register. These include the bride and groom's ages, marital status, abodes and occupations, their fathers' names and occupations, whether they signed the register or signed by their mark, whether they were married by banns, licence or Registrar's certificate and the names of the witnesses. Limited information on marriages after 1927 is available by contacting me. A footnote written in 1851 by the Rev. Frederick Hockin on page 50 of the Burials Register laments "that more than 40 deaths this year from smallpox, mostly young children, and not a single person to whom the disease proved fatal had been vaccinated". Another footnote written in 1863 by the Rev. Frederick Hockin on page 167 of the Burials Register notes "three other deaths, making a total of 16, took place in this parish in the month of January, the increase mainly attributed to measles and whooping cough". The Church is tied down by the law in all these respects"